Unisen Group (Dongguan KangMao Electronics Co., Ltd.) was founded in 1996, focusing on electronic interactive technology products, platforms and systems. In 2009, the production and manufacturing of the traditional OEM/ODM was transformed. Today, the company has developed into a high-tech enterprise that is committed to the user experience research and experience service, focusing on the Self- brand,e-Commerce, internet data application and the channel. Headquartered in HongKong, the company has R&D and production bases in the mainland and marketing around the world. It was awarded “Hong Kong science and technology innovation fund” and listed as a high-tech enterprise in 2016. 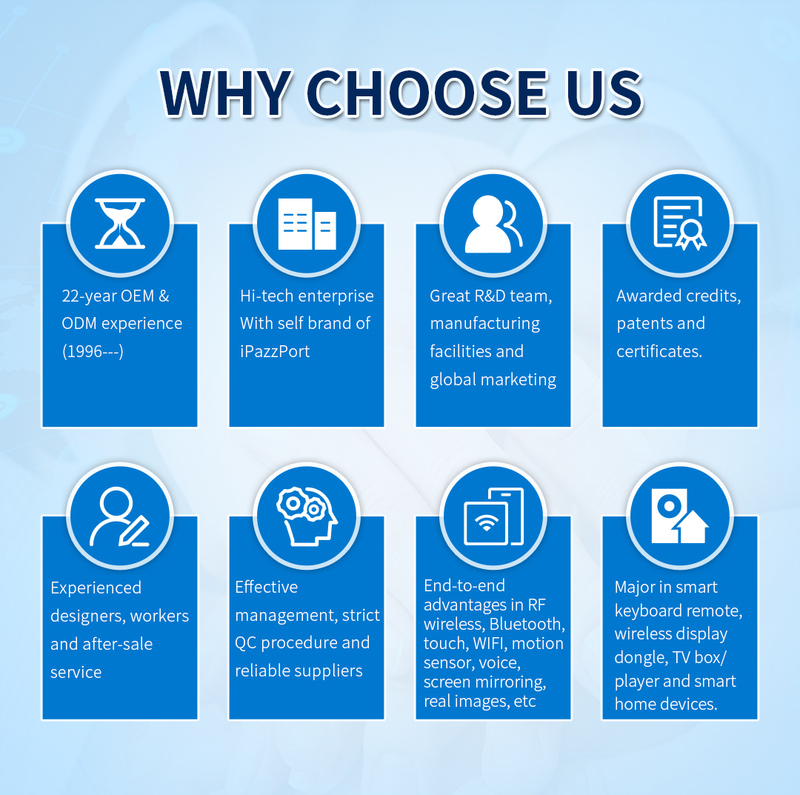 The company once cooperated with Intel, IBM and other companies in the field of R&D and has accumulated wide ranges of cutting-edge technologies of wireless Bluetooth, Touch, WiFi, Motion Sensor , Voice, Mirror Screen, Real Sensor，Embedded Design and other core intelligent interaction ones. Its target is to dig into innovative interaction ways of gesture recognition, voice recognition, touch control, biological recognition and face recognition, some of which have been developed to upgrade the traditional hotel industry into smart ones. The company independently developed and designed the world’s first wireless hand-held touchpad keyboard. 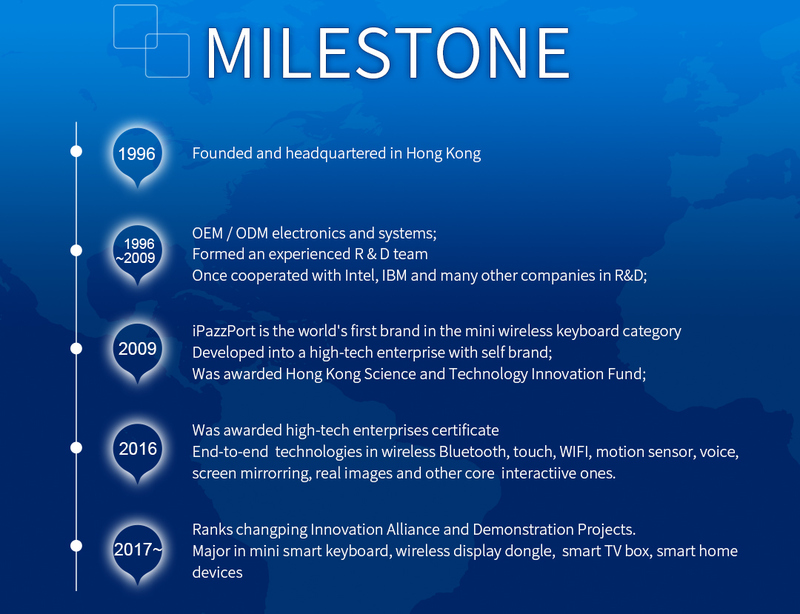 iPazzPort is the world’s first brand in mini keyboard category. The products that have been successfully developed are mini wireless keyboard, shared TV, smart TV player, smart TV remote control,WiFi smart plug, mirror screen, education and business series products, platforms and systems. 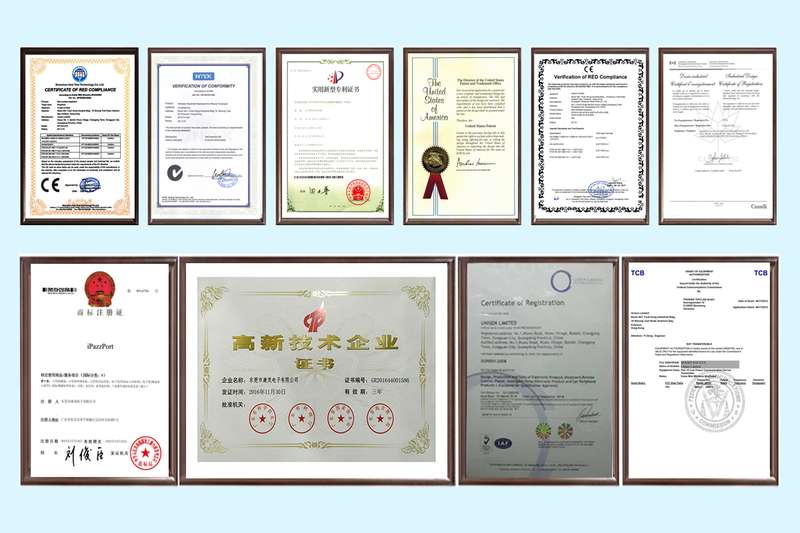 The company has an annual total production of about 5 million pieces of communication equipment that are in line with ISO9001 quality system, FCC, CE, 3C and other patent certifications, running CRM, ERP and other information data management systems. With forward-looking thinking and vision, the company has integrated R&D, manufacturing services and capabilities of Internet data application, concentrated on user experience research and service design, and built up the value-added services combining the shared TV, Internet + hotel service platforms. Based on Simplicity is a state of mind ,the comprehensive technical strength and scientific optimization management, and further more the ideas of wisdom(smart), professional and innovation, Unisen Group will serve better the Internet + hotel tourism, Smart Hotel / home, and even more for the development of society. Know more about OEM / ODM Service.